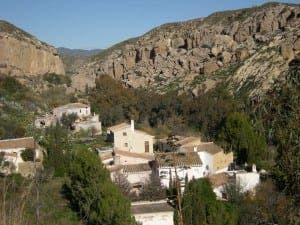 IT is Andalucia’s Garden of Eden – a green valley in the midst of semi-desert, hidden down a long winding road. 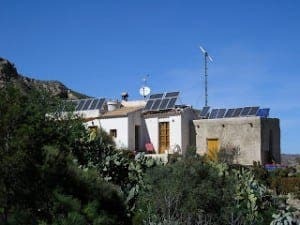 The off-grid eco village of Los Molinos del Rio Agua is a standout example of sustainable living. At least five groups now call the petite Almeriense pueblo home. Between them they have brought this a 100-year-old village back to life from near dereliction. 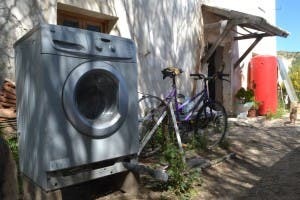 Living free of mainstream connections to water and electricity, the community is also a hardworking hotbed of green-minded experimentalism, creating everything from geodesic dome structures to bike-powered washing machines and Fender-style guitars made from sustainably sourced agave cactus. “Some of us have been here for over 30 years,” said David Dene, whose two houses act as home to a sustainable agave woodwork project and volunteers who come to the village to turn their own green dreams into realities. 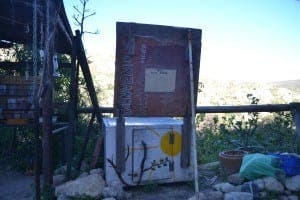 David began constructing his own house, La Casa de la Realidad, in 1993 after first visiting the village to volunteer at neighbouring project Sunseed Desert Technologies, a research base founded by ecologist Harry Hart in 1982 to fight against desertification. The pretty, whitewashed casa is perched on a steep ledge atop the valley, overlooking the mountains in the distance. Multi-coloured murals cover the interior walls, while a small wood burner radiates heat through the house. His other home, the downhill Pita Escuela built several years later, even includes a swimming pool which is filled by water from the stream in the valley bottom each summer. 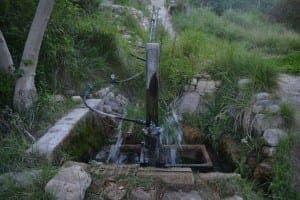 Both are provided with water from an underground store harbouring 9,500 litres. It is brought in to both homes at a rate of five litres per minute via a ramp pump in the centre of the village, built by a past volunteer. The 20 solar panels on the roof supply 2kw of energy, enough to power the house, which has a washing machine and a wifi router which serves much of the village. from 16 countries around the world,” said Dene, who designed both houses. “Word really spread. Lots of people seemed really keen to help build an off-grid, sustainable house. “We started with local rubble for the base levels, then constructed the walls. “The house is based on the ruins of an old family finca. The bottom part of the house where the main bedroom is was the donkey’s stable. “My aim was to try to rebuild it as faithfully as possible to the old style but with modern a twist. To Dene, living off grid encourages people to pursue other green ventures. “It gives us a sense of freedom and a sense of choice. We become responsible for our actions and start to think with freedom and creativity, enabling growth of similar freedom around us,” he said. Due to the low running costs of his house and his keenness to encourage sustainable living wherever possible, David welcomes newcomers wanting to realise their own projects. 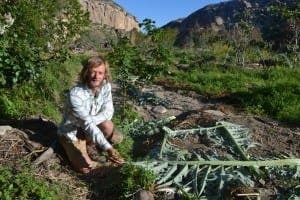 For the last couple of years, 27-year-old Jonas Lisy from the Czech Republic has worked Dene’s land, turning it into a biodiverse edible garden. Cherries, aubergines and moringa are among the cornucopia of fruits, vegetables and medicinal plants blossoming in the sizeable plot which provide sustenance to the other Casa de la Realidad residents. “It’s a wonderful opportunity,” said Lisy. “Because we have so little rain – only 50 ml one year – we had to start focusing on crops that can flourish in such conditions and support wildlife at the same time. His roommate, architect rom France, works for another project in the village, Cultura de la Tierra, which creates geodesic domes. These are moveable eco constructs. “I want to go into eco construction and create smaller, more mobile structures” said Handayani, 38. 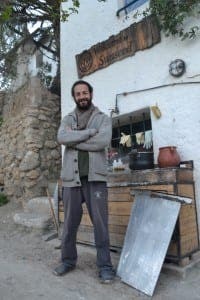 Sunseed Desert Technologies, on a renovated terrace a few hundred metres away, is a co-living base home to up to 200 project coordinators and volunteers annually. 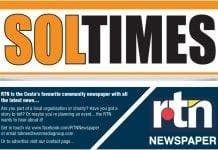 Some pay up to €150 per week to cover their bed and board. Nowadays it runs six departments involved in diverse research in areas such as bioconstruction and ‘appropriate technologies’. 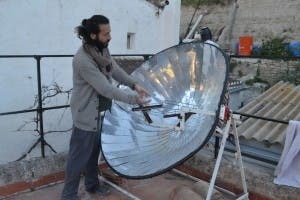 proudly besides one of Sunseed’s latest inventions, a solar-powered pizza oven, which rustles up stone-baked pizzas to the delight of passers by. The roof terrace is littered with dozens more off-beat yet functional devices, from a huge solar barbecue to more solar panels, which provide the project’s electricity. The compost toilets,created from locally sourced reedbeds, agave and stone, sit discreetly in the garden below. The bioconstruction team is responsible for the irrigation line, which also provides water for Sunseed’s in-house showers. Possibly most important though is the chalkboard hung on a wall in the patio, on which tasks are written and delegated to each of the projects’ workers and volunteers. The simple equipment is a basic yet vital organisational tool to help ensure that the ambitious project can continue to function. “We bring people out of their comfort zone,” said Sbonias. “But through living and working together we can open our minds to new possibilities of sustainable living, which is very important now with the threat of global warming. “Through our house and the things we create we hope to show how people can find a sustainable way to live that is also cost effective. “Everyone learns things here that we don’t learn in school.